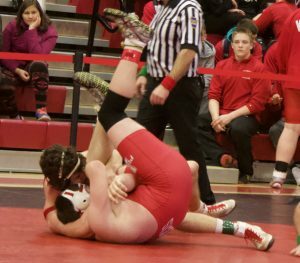 HYDE – The Clearfield Bison Wrestling Team brought 13 individuals to the PIAA District 4/9 AAA Championships, and they’ll be sending nine to the Northwest Regionals tourney next Friday and Saturday at the Altoona Area High School Fieldhouse. This Clearfield Bison wrestling team has been growing all year and shaking off injuries, and their hard work has finally culminated in a district championship. Clearfield edged DuBois for the team title, scoring 169.5 points to DuBois’ 158 points. In third place was Selinsgrove with 146.5 points. The thundering herd had a tumultuous day, but in the medal rounds, they ended up winning seven out of eight bouts. To boot, they scored bonus points in four of those. In the championship round, Clearfield sent four to the finals. Seniors Johnathan Thomas, Caleb Freeland and Avry Gisewhite, and freshman Mark McGonigal all made it to the championship finals with their semifinal wins Saturday morning. Wrestling for third place were freshman Nolan Barr, Karson Kline, and Oliver Billotte, and senior Jude Pallo, and junior Brett Zattoni had placed fifth earlier in the day to earn a trip to regionals as well. Going into the finals, Clearfield led the team score with 142.5 points, but the race was close, with Selinsgrove at 141.5 and DuBois at 140 points. Bonus points and winning matches were going to determine who the best team was in District 4/9. Clearfield went seven of eight in the championship round, and it all started with “JT.” Johnathan Thomas continued his inspirational senior campaign by major decisioning both of his opponents. After receiving a bye in the quarter-finals, JT went to work on Saint Mary’s Lane Dellaquilla, major decisioning him 14-5. Then, in the finals match, Thomas met against Cranberry’s Jacob Umstead. JT was taken down in the first period and trailed 2-1. Umstead may have had the better technique, but in the second period, JT started on bottom, got an escape and got two of his own takedowns to go up 6-3 heading into the final period, showing that he was in better shape than Umstead. Here, JT again showed his heart, wracking up another four takedowns to win 14-6. In the third and fourth place championship, Nolan Barr then came out at 113 pounds and got a second period fall over Punxsutawney’s Ben Skarbek, and Karson Kline did the same to Selinsgrove’s CJ Boyer at 120 pounds. “We got the two big wins early again. JT wins, goes out and gets the major. Karson and Nolan came back with wins and falls.” said Aveni. Those bonus points ended up giving Clearfield extra team points as well, and that ended up making the overall difference. It also may have given the Bison some extra momentum as their remaining lineup watched from the sidelines. With no Bison wrestlers at 126 and 132 remaining in the championship round, the next Bison to hit the mat was senior Jude Pallo at 138. After losing to Shikellamy’s Gage Wolfe 8-7 in the quarter-finals, Pallo dropped to the consolation rounds and rattled off two wins to reach the consi-finals, where he again met up with Wolfe. This time, Pallo wrestled with more confidence, securing six points in the second period with a takedown and three near fall from a near-side cradle. In the third, Pallo got another takedown from a funk roll to win 8-1. Moving up to 145 pounds, senior Caleb Freeland went 1-1 on the day. Freeland first beat Shikellamy’s Drew Balestrini 5-2 in the semi-finals before he met DuBois’ four time district champion Dalton Woodrow. Woodrow took Freeland down in the first period from a scramble off of Freeland’s shot and then got an escape in the second period. In the third, Freeland took neutral but no more points were scored. The final score was 3-0, Woodrow. At 152 pounds, freshman Mark McGonigal earned his first district title with presumably several more to follow. 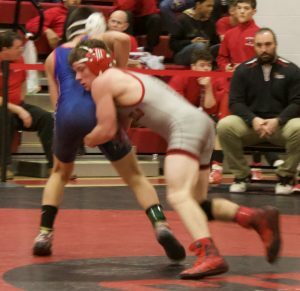 McGonigal received a bye in the quarter-finals before meeting up with Williamsport’s Owen Mahon in the semis. McGonigal handled Mahon and beat him 14-5. In the finals, McGonigal wrestled Saint Marys Johnny Wittman. McGonigal had a first period takedown to lead 2-0 heading into the second where he chose bottom. Following an escape, he secured another takedown over Wittman to be up 5-1 at the end of two after surrendering an escape. Finally, in the third period McGonigal earned another takedown and got a set of back points, but he gave up another escape and won 9-2. The next match in the championship round for the Bison was had at 195, but junior Brett Zattoni did place 5th at 182 to earn a trip to regionals in the morning session. Zattoni picked up a major decision and a tech-fall en route to his finish. At 195 pounds, freshman Oliver Billote had a great day and placed third overall. Billotte lost in the championship round to the eventual runner-up, but he also posted three falls on the day. Billote pinned Punxsutawney’s Josh Miller in the consi-finals to seal the deal for Clearfield’s team championship. Alex O’Harah. In the usual heavyweight fashion, the match went to overtime tied at one point a piece. But overtime ended quickly when O’Harah took a bad shot and Gisewhite got a takedown mere seconds into the fourth period. That was Gisewhite’s first district championship, and it was icing on the cake for a team that has taken it’s lumps this season. Unfortunately, four Bison wrestlers failed to place in the top five and stay alive in the post season. Freshman Luke Freeland finished his freshman season with an 18-17 record. Freeland had a tough day, going 0-3 at districts, losing each match by no more than two points and losing to Saint Marys Marco Paropacic twice by a 5-4 decision in the championship bracket and 7-5 in overtime for the 5th/6th medal round. 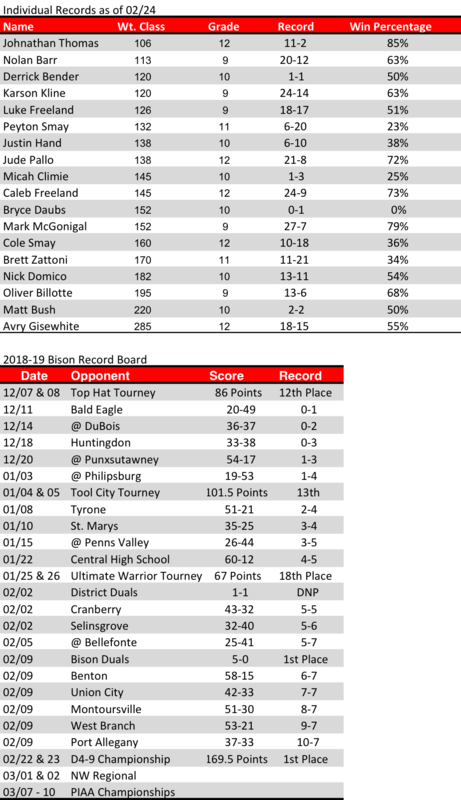 Junior Peyton Smay finished his season 6-20 and will head into his senior campaign with a 30-51 overall record. Smay went 0-2 on the day, losing to Cranberry’s Mitchell Rossey in the quarter-finals and DuBois’ Ryan Gildersleeve in the second consolation round. Cole Smay finished his high school career as a Bison wrestler as well with a 10-18 senior record. Smay was tech falled by eventual runner-up Colby Keane of Bradford in the opening round of the tourney. Smay recovered and picked up a 5-0 decision over Shikellamy’s Isaiah Betz in the second round of consolation. But Smay would then be pinned by Cranberry’s Eben Wry in the consolation semi-finals, and was then pinned in 39 seconds by Selinsgrove’s Dean Hollenbach. Smay finished his career 29-56 record. Sophomore Nick Domico also won’t be attending the regional tourney this year. Domico suffered an injury in the consolation consi-finals, where he was pinned by DuBois’ Eric Schneider. Following that, Domico forfeited in the 5th/6th placing round. Domico finished his inaugural season with a 13-11 mark, and an interesting 11 pins and 1 major decision to complement the victories. 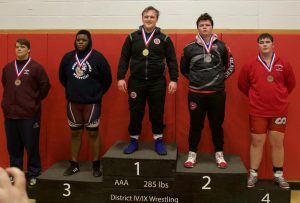 The next stage is set for the remaining Bison wrestlers to compete at the PIAA Northwest Regional AAA Tournament this coming Friday and Saturday. For full results, including team scores, finals scores and more, courtesy of PA-Wrestling, please click here. Results can also be found here, courtesy of Flo Wrestling.